If you’re in the market for the best bread maker on the market, then the Cuisinart CBK-100 2-Pound Programmable Breadmaker may be the one for you. Offering a variety of features and settings to produce tasty, mouth-watering bread, this bread maker provides numerous possibilities for French, gluten-free, and sweet bread. 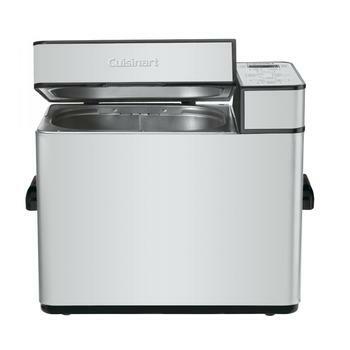 You probably need no introduction to Cuisinart as a brand. For God’s sake, you may even be more familiar with the Cuisinart brand than I am. I bet you have at least one or two appliances sitting in your kitchen corner bearing one of America’s most establish household name. 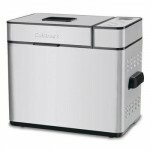 What you’ve not heard so much is probably Cuisinart CBK-100 programmable breadmaker. Is it a smart buy? Read on the rest of this bread maker review and decide for yourself how worthy of your investment is this popular bread maker. Is Cuisinart CBK-100 the Best 1-Pound Bread Maker? Whether your family is small or large, this best bread maker caters specifically to your consumption needs by offering you 1-pound, 1.5-pound, or 2-pound loaf settings. 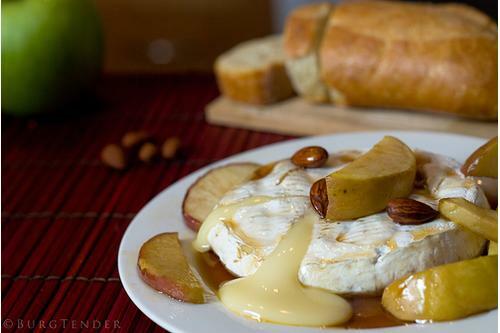 You only bake what you need so that you can maintain the bread’s freshness. If you purchase the Cuisinart CBK-100 bread maker, you can count on benefiting from the following advantages. From basic white loaves to complex sweet breads, baking with this bread machine is effortless. You simply need to add your ingredients, select your desired setting, and hit start, letting the machine do the work for you. Any simpler and you have to go to the grocery store to grab your loaf of bread. 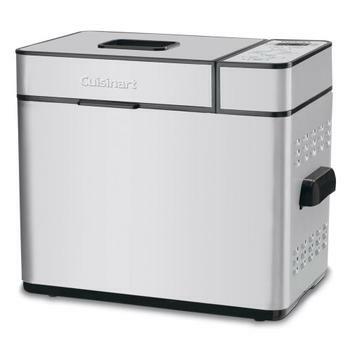 With sweet, gluten-free, and wheat bread requiring special temperatures and timing to get the perfect texture and taste, the Cuisinart CBK-100 eliminates any guesswork needed on your part to reach perfection. If you need to step away from the kitchen, the timer informs you when to add specific ingredients for fruit and nut loaves. If you’re pressed for time, this bread maker successfully shortens the time needed to bake fresh bread. There may be even days when you simply don’t have the time or energy to measure out all the ingredients. 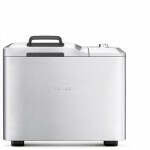 The Cuisinart CBK-100 comes with a packaged mix setting that allows you to add shelf-packaged bread mixes. You can even count on this machine to mix ingredients for pasta, dough, cakes, and jam. This unique feature allows you to control portion sizes and shelf life, and the included recipe book comes with recipes for all loaf sizes, minimizing the need to alter the measurements. While the slightly lower priced Breadman TR875 offers 11 pre-set options and the pricier Breville BBM800XL offers 13, Cuisinart CBK-100 offers 12. 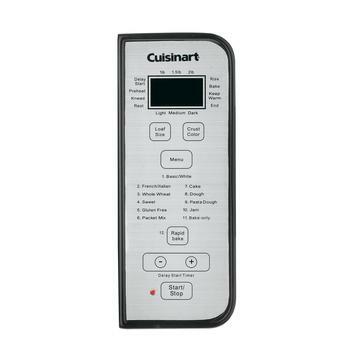 In addition to the 12 pre-programmed settings, the Cuisinart CBK-100 comes with three crust options – light, medium, and dark. A 13-hour delay timer allows you to add the ingredients but bake them at a later time for fresh, warm bread. Before the baking cycle begins, this machine beeps to let you know to remove the kneading paddle so as not to get it stuck in the bottom of your loaf. You can also utilize this machine’s warming feature to keep your bread warm until you’re ready to eat it. As with every bread maker, there are a few cons to purchasing the Cuisinart CBK-100. Some buyers have voiced their concerns over the following issues. 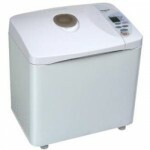 Depending on your counter space and kitchen setup, the size of this bread maker may be too large for your space. With a weight of 22 pounds, storing this machine can be difficult, especially if you use it on a daily basis. The LCD display for this bread maker can be extremely difficult to read due to the fact that there is little lighting in the background. You will need to pull the machine out into the light or use a flashlight to make sure you have selected the appropriate settings. You may also notice that the baking pan can dent easily because of its lightweight design. When removing the pan, you’ll need to make sure not to bang it on anything and to wash it by hand, minimizing dents and scratches. As reflected in a number of bread machine reviews, one common concern among owners of the Cuisinart CBK-100 is their machine is not truly programmable. As a programmable unit, the machine should have pre-programmed settings that can be selected without needing to change the baking cycles’ time. This bread maker does not come with this feature and does not allow you to create custom settings for your own bread recipes. But as some other owners have argued, expecting customizable setting for the price it fetches may be a bit too much. Such feature is usually something that is present only in the higher end models. Even though the recipe book does provide volume measurements for ingredients, it doesn’t offer weight measurements if you rather use a kitchen scale to minimize the cleanup process. Additionally, the recipes do not come with a total baking time, which would make it easier to set your delay timer. It would be an overstatement for anyone to tell you that you’ll be able to bake like a pro with these automatic bread maker. If baking perfection can be easily achieved by simply placing the flour mix and leave a machine to do the rest, such institutes as French Culinary Institute would have gone out of business by now. 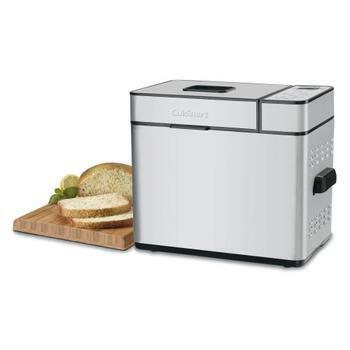 But if you want to savour the feeling of consuming your own freshly baked bread and make sure that nothing but healthy ingredients are included, Cuisinart CBK-100 has been the popular choice among individuals who share similar thinking as you.